This is a single THAT2180 VCA on a 4hp Eurorack panel. The PCB is similar in size to my other 4hp modules and it should work just as well in shallow cases & skiffs. It has a log CV response and is AC-coupled, so consider this one to be for audio only. As you'd expect from a THAT chip, it sounds fantastic. Another compact, "clean audio" module to go along with the mix. Unlike most of my small-board projects there's no room on this one to add the MOTM power header or mounting holes. I'll still be happy to sell you boards without panels, but you're on your own as far as getting them into your preferred format is concerned. The pots are set 1" on center & are Alpha 9mm-type parts if you choose to go with board-mounting. 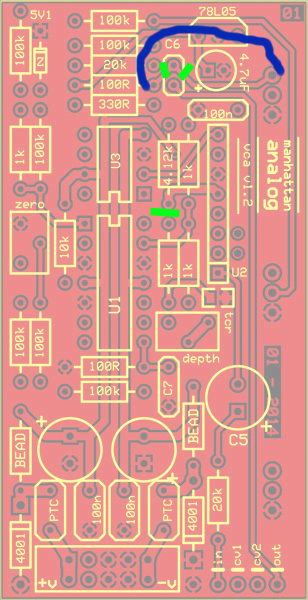 I've reposted littlem4tt's image here, it shows the trace cuts (green) and jumper (blue) that need to be done to rev 1.2 PCBs. 1) Red probe to the pad on the PCB marked TP. ("Test Point") Black probe to ground. 2) Set offset control to max CW (full volume) or insert a +5V CV source into one of the inputs. 3) Use the trimpot labelled 'zero' to set the voltage @ 'TP' to 0.000V or as close as you can get. 5) Use the other trimpot to set voltage @ 'TP' to 305.00mV, give or take ~3mV (~1%). It should then open fully to unity gain with a +5V CV signal. The 5.1V zener diode should limit the offset + incoming CV sum to ~5.14V, so if you mash it up to the diode's break point you'll get a little bit of positive gain with the unit trimmed to unity at +5.00V. If you want to ensure you get no positive gain, max out the diode by applying a CV signal greater than ~5.3V and calibrate to unity at that point. Alternative CV sensitivity is possible - you can set it up to accept 8V or 10V signals by changing the zener diode to an appropriate value and trimming as above. A different LM78Lxx regulator can also be used to supply the appropriate voltage to the offset control. 2 panels and 2 pcbs please again to the UK - and there is a big gap in my euro waiting for your svvcf!!! I'm down for 2x PCB and 2x Panel delivery to UK. Is it possible to add to the Mindreader and 4x4x4 shipment, or will there be too long a wait between them going out? Ginko really does speak the truth about the SVVCF. The SVVCF is next. There's nothing else on my plate. It's still 2 solid weeks of layout/prototyping away from being ready, but at least I can focus on it now. 2xPCB and 2xPanels for me please (+ shipping to France). 1 x PCB, 1 x panel, shipped to UK. Can you put me down for 1 pcb and 1 panel please. 2 x PCB & 2 x panel please. Also to the UK. What are the three pots for? Initial gain, input CV attenuation and something else? Either way I'm down for 2x pcb and 2x panel, might double that before the cutoff though. One panel and one PCB please (to France). I am new to this format and am interested but couldn't work out how front panel and PCB are fixed together. Is it just the pins on the 3 pots, or am I missing something? Once the pots are soldered into the PCB the pots go through holes in the panel and then are fastened to the panel with the nuts on the pot shafts. Great! Two PCBs please. US shipping. I sometimes wonder how many of my modules are hidden away in backlogs... most of what I offer are quick builds, though, so maybe not as many as I fear. These won't be ready to ship for about 6-8 weeks... ~3 for orders, ~3 for manufacturing, ~1 to ship to me, plus any delays that might pop up.